Parker Duofold Streamlined Junior fountain pen and mechanical pencil set from after 1931. 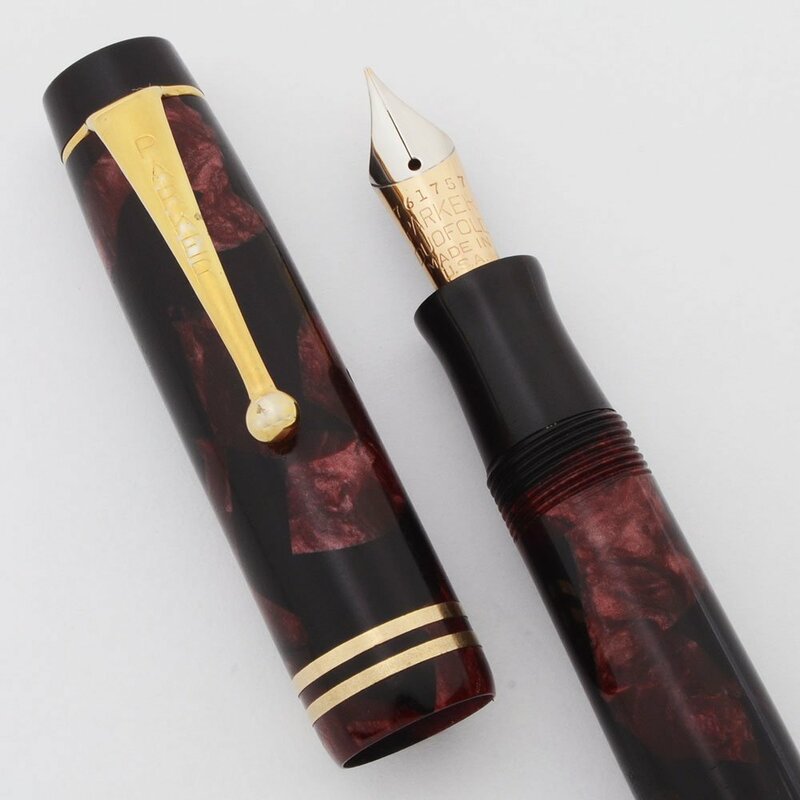 The pen is a button filler in burgundy and black with gold plated trim and the double cap band. Fine gold Parker Vacumatic nib is uncommon two-tone variant, and the nib it smooth. The mechanical pencil takes 1.1mm leads. Excellent condition, very smooth and shiny, with light signs of usage throughout, fully restored and working well. Manufacturer and Year Parker, made in USA -- after 1931, when the burgundy marble color was introduced. 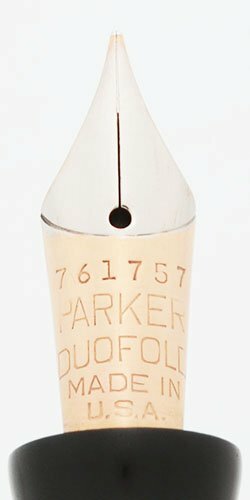 The two-tone nib was produced for one year, 1932. Length Fountain Pen: 4-11/16". ; Mechanical pencil: 4-13/16"
Filling System The fountain pen has a Button filler. We've restored it with a new sac and it's working well. The mechanical pencil takes 1.1mm leads. 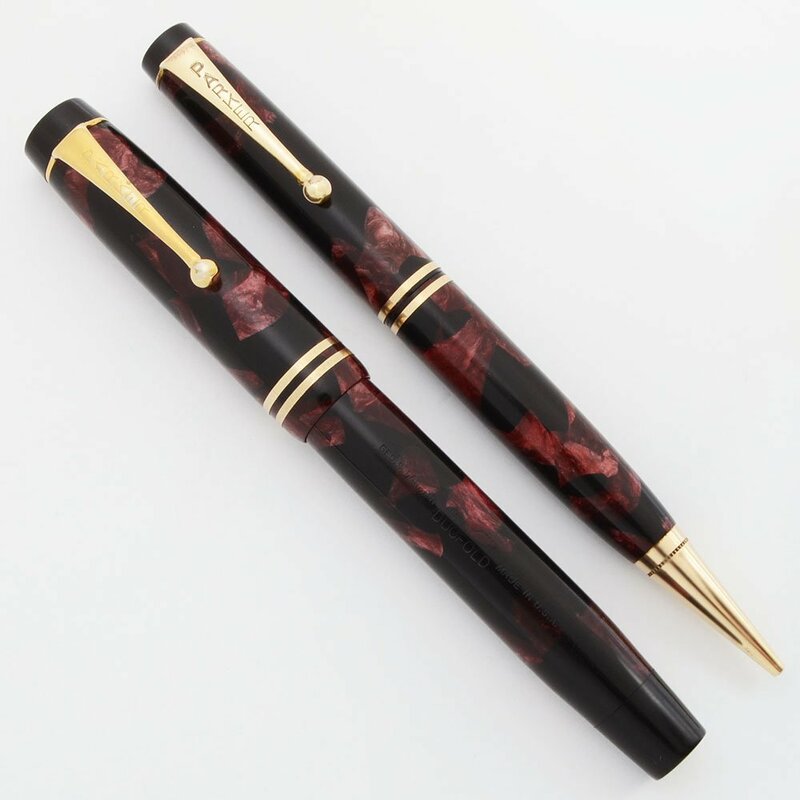 Color The fountain pen is burgundy and black body with black endpieces and two narrow cap bands. The trim is gold plated. The mechanical pencil is the same color and also has two narrow cap bands and a 1" gold tip and a black endpiece..
Nib FINE Parker two-tone nib is smooth and firm with great tipping material. 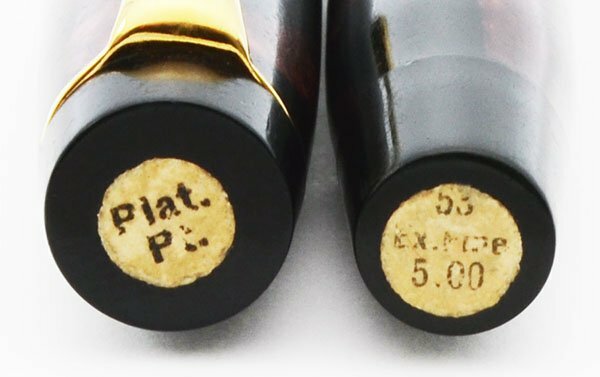 Two-tone Duofold nibs are very uncommon. This one has a serial number. They were only produced in 1932. Condition Excellent condition with no cracks or personalization. Both the pen and mechanical pencil look great in hand. They are smooth and shiny with nice clear imprints (especially the mechanical pencil). The pen has original stickers on the flat black end or barrel and top of cap (see photos). Both pieces have light scratching and handwear, the pen more significant than the mechanical pencil. 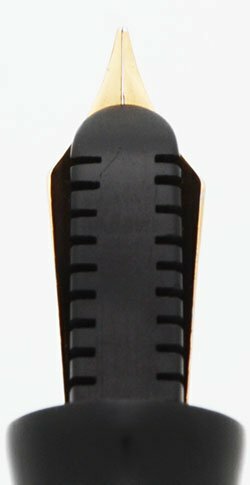 There is a chip on the pencil just beneath the black endpiece under the gold ring holding the clip. There is also some plating wear on the ball and very top of the clip on the mechanical pencil. The clip on the fountain pen is beautiful.